IT’S NATE and BECCA’S BOOK!!!!!!!!!!!!!!! I have been dying to read their story since book one, Rookie Move, and now that we finally have it, I can tell you that their story was well worth the wait! I don’t know if it was because of the time in between books or simply because I haven’t really been reading lately but it took me a chapter or so to remember where we last left off with the Brooklyn Brusiers hockey team. Once I was able to get my mind back into the world of the Bruisers, I remembered just how much I’ve loved this entire series. Each of the books in this series has it’s own unique characters and love story, but they all have this feeling of simpatico that I would imagine comes with being a part of a team. I love slow burn reads. The delicious anticipation of the will-they-won’t-they is possibly my favorite type of romance. Nate and Becca kept us waiting through 3 previous books to finally find out it they would and once that question was answered it gave me the most amazing feeling of satisfaction. Author Sarina Bowen has perfect intuition to know just when to stretch out the burn and when to finally give us our answer. She’s a slow burn master if you ask me. 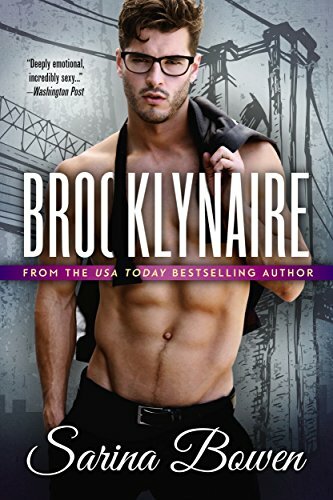 Brooklynaire can totally be read as a standalone but I highly suggest you start with book one, Rookie Move. Nate and Becca are seen throughout the series so if you skip the beginning of the series, you’re cheating yourself out of the full extent of the delicious burn. If you insist on reading this book before the others however, I don’t think you’ll be terribly disappointed. Much of Nate and Becca’s backstory is given in the chapters of Brooklynaire so I doubt you’ll have any issues following along with their story. I give Brooklynaire 5 out of 5 Krissy’s Stars! *I was generously given an advanced copy of this book in exchange for an honest review. Add Brooklynaire to your Goodreads TBR! This entry was posted in ~*~Reviews~*~ and tagged in brooklyn bruisers, Hockey, slow burn, sports romance, Workplace Romance.